Tomos Parry has been attracting attention for his skills with wood-fired cooking since he headed up the food offering at Climpson’s Arch. 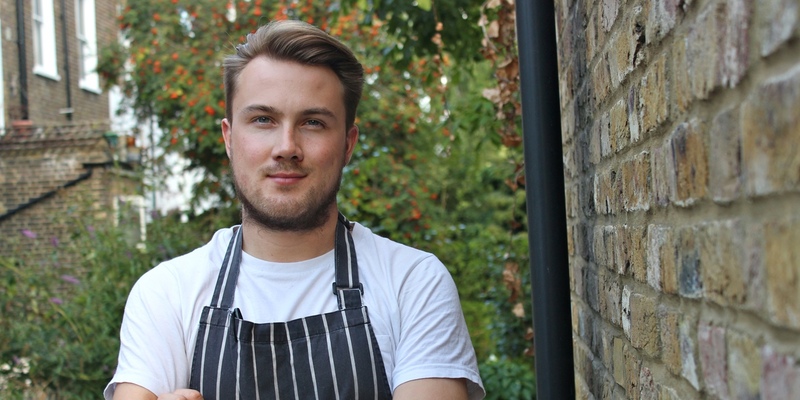 Now running the kitchen at Kitty Fishers in Mayfair, he endures the relentless, sweltering temperatures of the grill to bring creative, Celtic-inflected cooking to London’s diners. A degree in politics and history is not the typical route into cheffing. Tomos Parry told us: ‘I still passed, but I knew cooking was what I wanted to do.’ Positions in Cardiff then London followed, where he secured a role at The River Café: ‘They had incredible produce and that got me excited – it was phenomenal!’ After that came a stage at Noma where he met James Knappett, going on to help him open Kitchen Table at Bubbledogs. But it was at Climpson’s Arch, a space under the railway in Hackney, that Tomos Parry was able to develop his skill with a wood-fire grill. I like having restrictions in cooking, it helps creativity in a way. You can have all the cooking gadgets in the world, but what are you doing with them all? There’s no way you can master all of them. I think as soon as you get over the fact that you’ll never make anything new it helps you become a better chef. Some people get so stuck on creating something new that they forget about the food and its flavour.